For whatever reason, this photo (credit unknown) was extremely poignant to me this morning. Maybe it’s because I love playing softball or maybe because I have so many great family memories at the ball-fields? 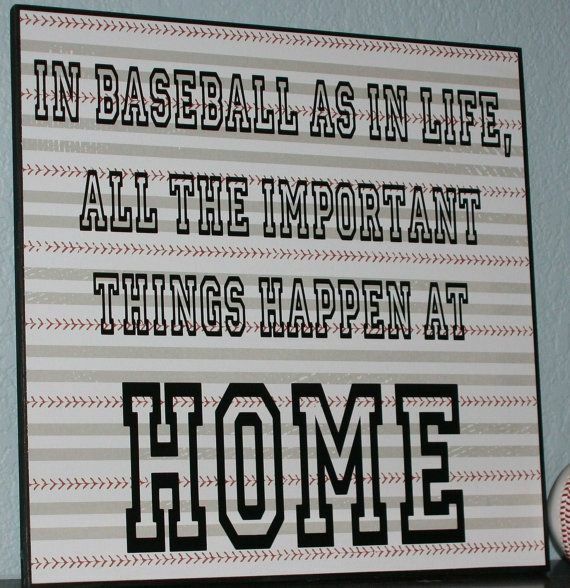 Perhaps it’s because baseball is my favorite sport to watch. I think it’s mostly because I have a clear understanding of what goes down at home-base. I have an intimate relationship with being in the bottom of 9th inning on third base with 2 outs and a batter up. Whatever happened I needed to get myself home. Being in the same situation when I was the one up to bat was perhaps the most intensely anxiety ridden experience of my life-time. I remember vividly the day in 8th grade when I became the hero. I was the last batter (not necessarily the most skilled) who happened to be kind of an overweight nobody with not many friends. Monica Sharpe was the opposing pitcher and nobody, I mean, NOBODY, could pitch as fast at that girl. (Not even professional baseball players) The game was tied. There were 2 outs. We had a player on 3rd and I was up. It was a full count. I was a nervous wreck. Monica (who later in high-school became a great friend of mine and a teammate) had already struck out many of our greatest batters multiple times. There was no way that insignificant outfielder Alice was going to succeed. In fact, the team’s disappointment at who was up to bat was pretty obvious. But succeed I did. I nailed a line drive down the third base line. I got a slow start (out of shock) to first – I couldn’t believe I had even made contact with the ball. The opposing third baseman got the ball and our runner headed home. The baseman did what she was trained to do and went for the easy out at first instead of the one at home. And I BEAT the out by about .001 milliseconds. And our runner won the game. Actually I won the game. The team went crazy! The next 20 minutes of my life are a blur, but this is perhaps one of my most favorite memories. I had never felt so pleased with myself. I had never felt so validated, honored, or victorious. This photo stood out to me this morning because of it’s metaphorical value to me and my desire to love being at home. If I can imagine my home life as home-base maybe I can catch the vision of its importance. Maybe I can catch the vision of my importance. So what if I am not the runner? What if I am the scared little girl up to bat? And what if just making contact with the ball is good enough to win the game? No what ifs. That is exactly what I am faced with every day. So today, my washing machine, dirty dishes, chauffeuring duties, and patience with one extremely trying toddler all have the name Monica Sharpe on them. And my goal is to just make contact with the ball. I can do that. Thank you to Dieter F Uchtdorf for my other inspiration this morning that I just re-read from this inspiring address about living without regret. I never would have listed home-run hitter as a talent, but, yes, once in my lifetime I was a home-run hitter. “Get back. Get back. Get back and back and back.” [I just screamed that as loud as possible for Monica to hear from my dugout called home.] Screaming those team cheers was always one of my talents, and my kids will tell you the screaming is still on my strength list – and it’s not unimagined. Here’s to letting go of the screaming and turning on the home-run hitting. Keep you’re eye on the ball, mom.